Timed series are important because they demonstrate varying features for disease flow patterns. These patterns have a particular behavior that recurs in spite of the different areal patterns that follow. This observation was common following the 1832 cholera epidemic in the United States. Whereas yellow fever returned to the same area, at times in sequential years, cholera seemed to diffuse more inland. The last of the studies of yellow fever diffusion were already suggesting reasons as to why this inland diffusion was taking place–transportation routes and methods were become more efficient and more successful at carrying large amounts of people into the hinterlands. In spite of this economic development, the theory for yellow fever remained focus on the oceanside ports and harbors. 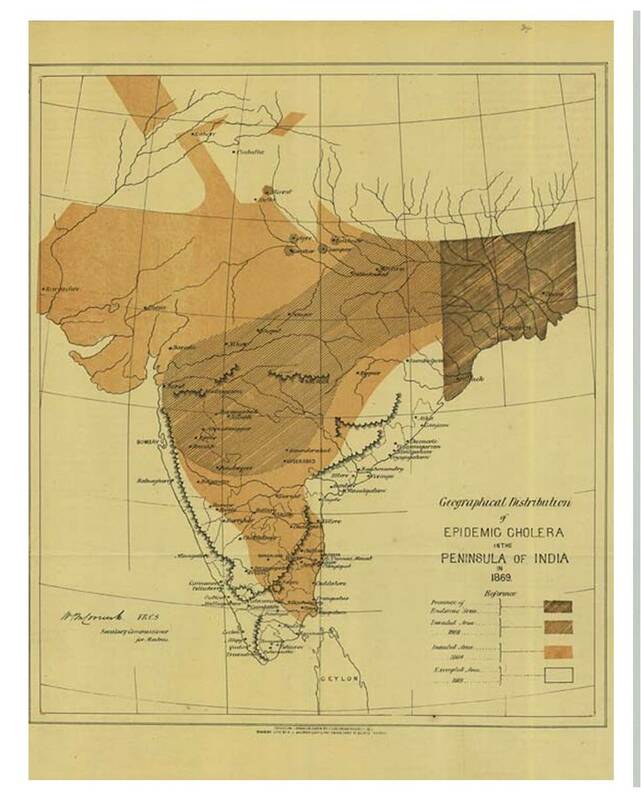 This resulted in the first of the disease maps depicting yellow fever as a coastal epidemiological behavior, enabling Asiatic cholera to lay claim to becoming the first transportation route definable disease pattern using disease maps. During the yellow fever years, it was the commonalities of its different disease patterns that helped define the requirements for its onset as a disease. Whether the cause was foreign or not, infection and contagious or not did not always matter. The small area causes for the disease behavior once it began were felt by all to be related to hygiene and filth, a consequence of population growth and poor sanitation practices engaged in around large numbers of people. When reviewing disease areas mapped for yellow fever and the later cholera epidemics, we can begin by assuming that some features are truly diffuse in nature, meaning that they are equally distributed across space and time. In theory, if these were the only things that a disease migration depended upon, then that disease should spread evenly in all directions if it is areally or diffusely scattered. But most of the diseases that are mapped are dependent upon the behaviors of their victims, be it animal or human. Therefore, there is some sort of linear process involved as well with regard to disease spreading patterns. In the simplest of cases, there is a disease cause which spreads equally in all directions, which in turn is picked up or captured by a host or carrier, and then transferred to other places by this carrier, or is exposed to another carrier that is an organism. The migration of these carriers are what defined the linear patterns responsible for disease diffusion. Their manner of transportation mattered, as did their tendency to travel in accordance with wind patterns and sometimes water flow patterns. As more became known about these animalcules and the diseases they were suspected of carrying medical geographers came up with some uniquely new theories for disease diffusion. One medical geographer blamed diseases on the shady side of a mountain on the unique soil creatures surviving in that environment. 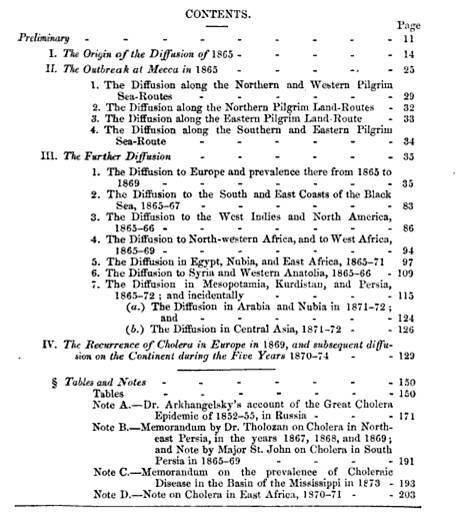 Another medical geographer tried to lay blame for the yellow fever correctly upon the animal kingdom, but lost his argument with his peers due to the fact that this rule could not be applied to all of the small animals surviving in the epidemic region–epidemiologists had yet to realize that different animals or animalcules did indeed have different behaviors when it came to the disease diffusion process. Even the famous physician realted to the development of the homeopathy theory of medicine had his say in the relationship that existed between animalcules and disease, laying blame for some diseases on some of the very small, invisible “flying” pests. In a spatial sense, these arguments usually inferred that a disease was felt to be purely aerial in the nature of how it is spread. Should a disease demonstrate a perfect multidirectional diffusion process, influenced by topography and airflow patterns, then it is indeed a miasmatic disease in the traditional medical geographer’s eyes, and thus is possibly endemic in nature–natural to the regions ecology, topography and climate. This might also imply that such a disease could flow in nearly every direction equally, meaning it could flow up the hill to infect higher elevation regions should the daily montane wind patterns so permit. This type of disease flow is very different from the linear pattern of diffusion defined by people and their transportation routes. Any geographer reviewing these models for spread would immediately realize that topography appears to be secondary to the nature in which the disease flows and re-erupts in new places. Each time a well-populated region is reached, the disease is reborn–thus the proof needed for its contagious nature, its foreign source of origin, and its dependency upon the presence of the population, its epi– status in combination with its demos quality. This its classification as epidemic. This provides reason for why many diseases that were purely linear in nature in the early 19th century writings end up being termed epidemic in nature. These epidemic diseases spread along the various path its human carrier or victim travels, regardless of its nature as some biological form of disease with obvious meteorological and much later ecological causes demonstrated for its recurrence, as well as for purely human born contagious disorders that are purely behavioral in nature, like the “epidemic chorea” experienced as a result of spiritual revivals being bred along the inland, overland migratory routes. The third important aspect of disease migration that defines its exact diffusion pattern is related to the topographical and other spatial and temporal differences a region and their neighboring regions have. 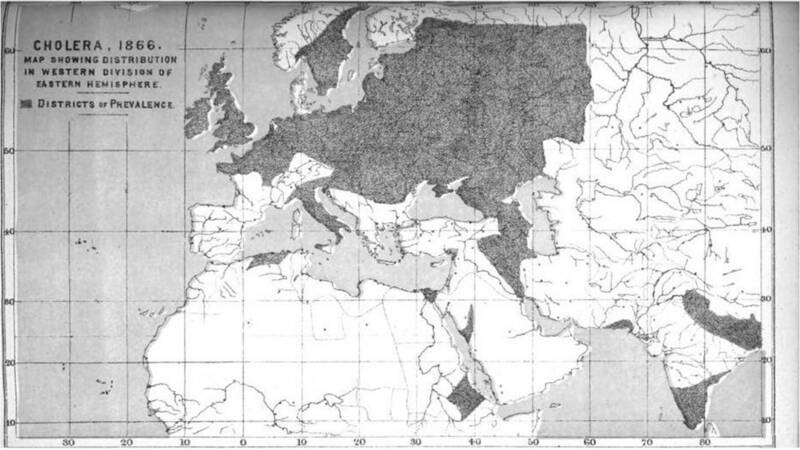 Normally it is this third aspect that disease mapping focuses on, although there are later some topical maps developed depicting human health patterns as well, and it is this third factor and its numerous, often hard to define sub-components that make disease mapping such a complicated task for late 19th century medical geographers. In some ways, we can predict a lot about migration habits (although animals are much less predictable), but we cannot as easily predict the exact flow of natural events like cloud movement, airflow directions, cold front migration behaviors, and their related features like the directions that vectors and carriers or hosts might travel, or the ways in which the water will flow and move a particular pathogen from one region to the next. These sciences were not as of yet perfected, thus the commonness of demographic, transportation based disease maps in the years just before the bacterium was proven to be a cause. Spatial disease theory and maps have thus evolved from a primarily point area review of cases to a point-line-area type of review. Adding the point theory to complex disease flow patterns is important because it is essential to defining the nidus or nest for a disease, be it endemic or epidemic in nature. A disease nidus is a place susceptible to new disease development. It involves a chaos theory related series of events, meaning that the exact same event could take place on the exact same point twice, with the resulting outcomes for each of these identical events more than likely be very different from each other for each event. With disease diffusion processes, this is very much the case, making it difficult for disease mapping programs to define the exact routes of travel or migration that may be involved with each new pre-epidemic event that erupts. We can at best state the hierarchical method in which the disease is most likely to spread, but not exactly which route will be followed. With each new nidus or centroid that is defined in this hierarchical pattern, there are new avenues that may be taken for each new epidemic that develops. A disease may erupt in the exact same nidus, such as the urban New York or New Orleans ship poor setting, but follow a different migratory pattern as it progresses. These new routes are based upon certain recurring features like physical topography, but also have features that are never identical from one time period to the next, such as climate, temperature, humidity, wind flow, and people’s migration patterns. This is why the various ways in which researchers try to categorize disease flow patterns often have some fairly helpful and accurate starting points to be used in real time, but once the disease flow commences, and predictions are in the works, these models become less and less likely to be true with time in an attempt to define the specific route or diffusion pattern a disease is expected to take. It is easier to define the type of setting where a disease might commence and then define various places it is likely to migrate to next, based on the three forms of diffusion that might commence (purely diffuse, linear transportation related, and complex topographical/environmental). The more we take a look back at prior diffusion patterns and define their contributing factors, the more likely we can produce a fairly accurate predictive modeling tool for defining where the disease might strike next. Two examples of diffusion patterns related to this thinking, noted on the page covering Cholera on the Oregon Trail, the hierarchical, reversed hierarchical and non-hierarchical processes that I defined may be considered. The purely hierarchical model focuses on people and place (urban, highly popular settings). The reversed hierarchical model focuses on people in low income, poverty settings typically surrounded by “filth”, places which serve as prime examples of locations where sanitation theory has to prevail for disease prevention to ensue. The purely non-hierarchical manner of looking at disease is mostly diffusion and natural history based. The diseases that engage in this behavior are primarily nature-dependent and secondarily hominid-dependent. They are the primarily represented by the zoonotic diseases and azoonotic disease of natural, environmental cause. These latter interpretations of disease are the product of two very important Russian disease ecologists–Pavlovskii (also spelled Pavlovsky) and Voronov. The next two series of maps depict temporal diffusion patterns. The overall patterns have learned diffusion behaviors that tend to recur. But with each new epidemic a certain amount of variability due to “chaos” exists. The first series demonstrates order, predictability and confluence. The second much lengthier series depicts the effects or chaos upon the spread pattern. Underling the second series is this natural climatic cyclicity that is possibly involved as well. Periods of drought, varying El Nino patterns, what have you, are exerting their effects on the recurring vibrio natural followed by human ecological patterns. Unlike yellow fever, its virus and the mosquito, there is a primary ecology of the vibrio that has to be considered. Due to these ecological reasons, yellow fever mapping is very different from cholera mapping. The skills of the first were necessary for the development of the skills of the latter to commence. Point and disease ecology maps could now be used to help determine the cause for this linearly spread disease pattern. 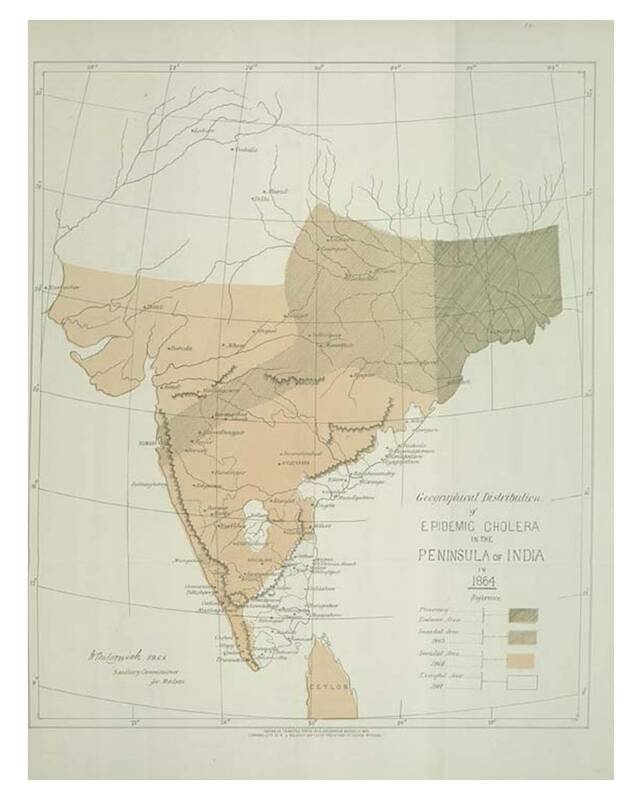 In the above maps, note the sequential stages of diffusion across Hindoostan. 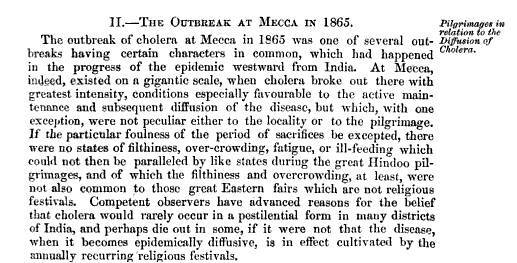 Cholera began its first transportation away from Hindoostan ad deep into Europe between 1817 and 1819. 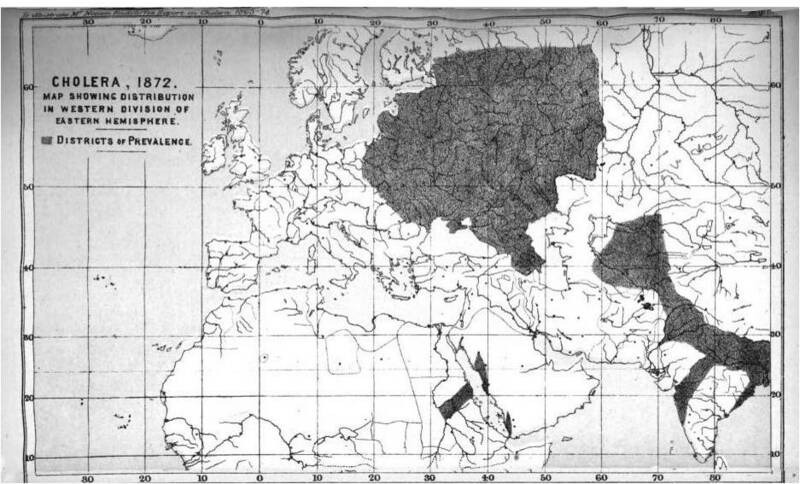 The second phase of this overland diffusion or migration of the disease to places between 1829 and 1832, by which time the disease had progressed significantly into the interior or Eurasia. This migration was due in part to improved, more rapid transportation patterns, technology and behaviors, but may also be due to some modifications in the Vibrio cholerae genome. One or perhaps two more global migrations of cholera then ensued–the first in 1847/8 and the second possibly in 1855, assuming it is not a continuation of the original 1847/7 epidemic pattern. In 1859, cholera began impacting the untouchable interior of Hindoostan, but the distance into the center of this nation, the topography, the lack of dense human populations and the limitations of transportation made its travel from the east coast westward to the ocean edge, as and from the west coast eastward back towards its nidus, provided an impassable barrier. This barrier no longer existed in 1864, and the migration across Hindoostan perhaps represents the trans-Ural mountains diffusion process that took place in Russia in 1832, or the overland Oregon Trail diffusion to California between 1849 and 1852. Both of these would have followed a fairly narrow strip of land, one heavily travelled and therefore well settled by local populations. 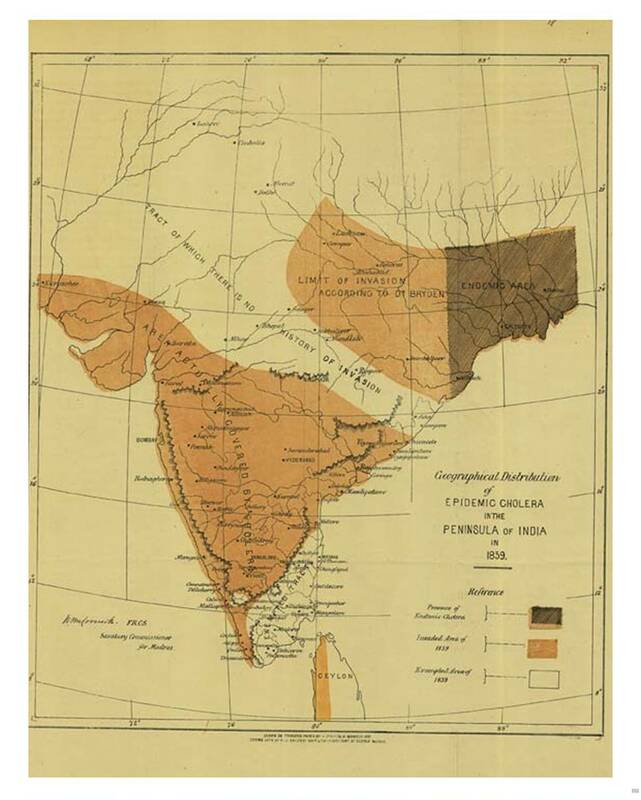 The same is possibly true for the width of the 1864 trans-Hindoostan migration of cholera. In 1869, this trans-Hindoostan route is perfected, enabling the disease to travel in either direction. The infected area band is widened, perhaps truer in form and nature, and a new route has formed heading northwestward out of the region. Closer views of these maps follow. Note the differentiation of endemic and epidemic regions. A more detailed description of this disease ecology depicted on maps follows. Government Board In Supplement To The Annual Report Of The Present Year. London, 1875. 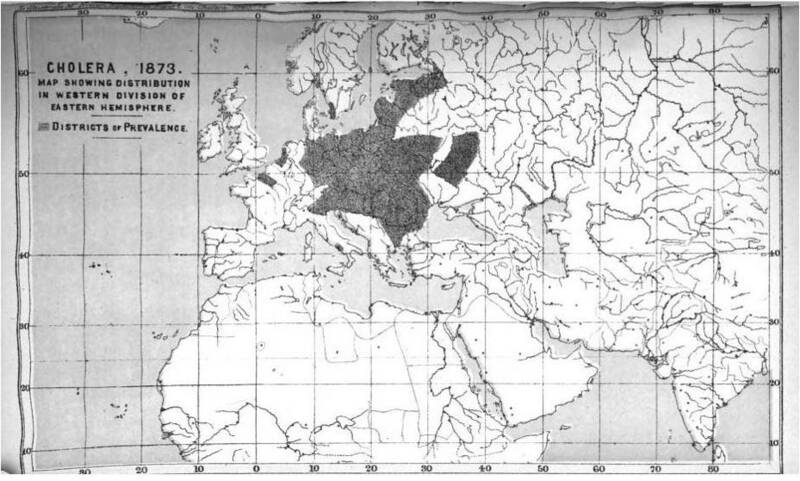 The diffusion of Asiatic Cholera out of Hindoostan to form an isolated diffusion pattern in Western Europe is a unique event in cholera history. The nidus being in what is now Pakistan at the end of the Ganges River, in close association with a delta and its unique subaquatic terrain features (the delta detritus and debris), the recurring warm climates, and the large transportation and human population features provided vibrio, the cause for cholera, a unique opportunity to constantly redefine its genetic make-up, periodically infecting people in between those periods where it is residing naturally as a part of the local animal ecology (its depends upon the local bottom feeding crustacea, icthyes and the “animalcules” that survive upon suspended organic debris and smaller microorganisms). Once the epidemic becomes land-born, it become more human dependent in its activities. The migration to Mecca was the primary way it could make its way into a setting where large masses of people aggregated, enough to facilitate the rejuvenation and redesign of its genetic make-up, in turn enabling it to be carried further westward into Western Europe. In time, the source for the epidemic returned to its natural ecological state and few human cases erupt in the nidus region, with large numbers of cases erupting in a newly isolated demographically, meteorologically, and topographically defined social setting. Although somewhat simplified, this description demonstrates how the Asiatic cholera became a pandemic disease that was globally born. 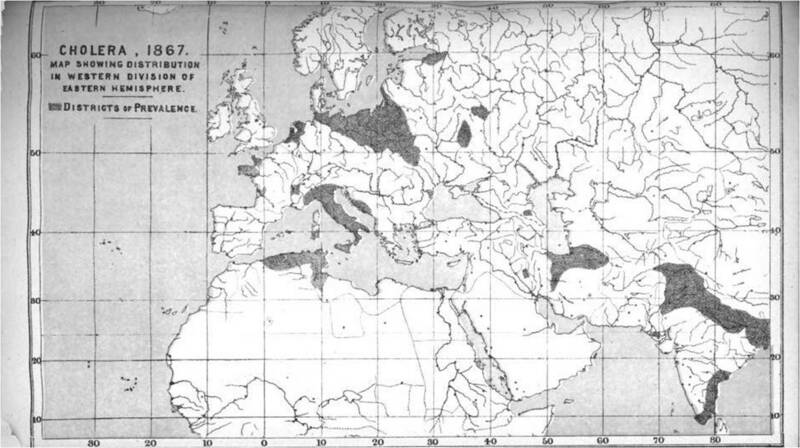 The initial years of the spread of Cholera from Mecca to Europe. The final years in this timed series, with Cholera defining its own natural history and progress during its impact on parts of Western Europe, followed by an inactive period as a landborn feature in Hindoostan in 1873, one of the chief years North America became impacted. The nidus in Hindoostan reached its human ecological peak and subsequently died off above the delta water level.